Figure 1. 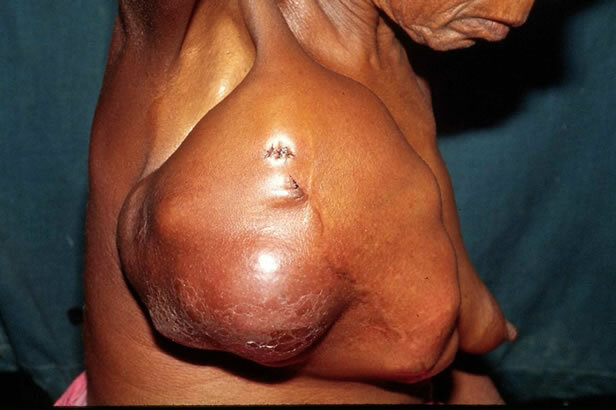 A large phyllodes tumour involving the whole right breast. The scar of previous surgery is seen. however revealed no metastasis. A core biopsy of the lesion confirmed borderline phyllodes tumour. She underwent mastectomy without reconstructive surgery. The histopathology report confirmed borderline phyllodes tumour (Figure 3) with tumour free resected margins. When last followed up 5 years later she was doing well with no recurrence. Figure 2. The large phyllodes tumour revealing the stretched overlying skin in the lower quadrant. Figure 3. Histopathology of resected specimen revealing borderline phyllodes tumour with pushing margin and stromal atypia. apparent for several years, but they only come for evaluation when the mass has suddenly increased in size. Delay between the first symptom and presentation can vary from 2 days to 15 years and a breast lump is noted in 74% of these patients . The other symptoms include mastodynia (14% to 42%) and less frequently skin ulceration (2.4% to 10%) of the cases, which are usually associated with large or malignant PT [4,7]. Due to the large size of the tumour the overlying skin is tense and presents with visible and dilated venous plexus that may eventually ulcerate . The tumour size is reported to vary from 5 to 450 mm with a mean size of 40 to 70 mm [1-8]. PT is unilateral in 96% of cases with very few cases of bilaterality reported [3,4] They are commonly found in upper quadrant (46%) with an equal propensity to occur in either breast (48.8% to 50%) [3,8]. PT can be extremely difficult to differentiate from fibroadenoma, which is sometimes treated with a nonoperative approach. For this reason, early diagnosis of PT, which often includes surgery, is pursued [1-4]. The preoperative diagnosis is reported to be achieved in 10 to 29% of cases using various diagnostic modalities . Ultrasound examination of the breast has distinct advantage as an initial investigation in view of its ease of performing and availability. Various diagnostic features, which are characteristic, include a well-circumscribed lobulated mass, heterogeneous internal echo pattern and lack of microcalcification [4,10]. Patients with fibroadenoma are generally younger than patients with PT and have a larger ratio of length to anteroposterior diameter and are generally smaller in size than PT . Attempt to establish a preoperative diagnosis and to differentiate between malignant and benign PT through the use of colour Doppler ultrasound has been made . The feature that is suggestive of malignancy includes marked hypoechogenicity, posterior acoustic shadowing and higher vmax (systolic peak flow velocity) . Mammography however is reported to be extremely low in accuracy in differentiating a PT and fibroadenoma. However, in tumours which are large, presence of irregular margin are more likely to be predictive of malignant PT rather than benign PT. MRI has also played a significant role in diagnosing difficult cases. The feature characterizing benign PT included a lobulated or polygonal shaped mass with smooth border, which may be cystic and septated and has a gradual or rapid pattern of time signal intensity curve . The reported pathognomic feature of PT also include characteristic leafy internal morphology, best shown in subtraction MRI which highlights the enhancing cotyledons solid pattern within irregular blood filled cystic spaces . Preoperative histological diagnosis can be achieved by fine needle aspiration (FNA) or core biopsy [10-13]. The role of FNA in establishing a preoperative diagnosis is limited with reported success of around 12%, the limiting factor being the common cytological feature with fibroadenoma (FA). However, the presence of elongated spindle cells in the background is reported more likely to be present in PT, than FA . Core biopsy is preferred for establishing a preoperative diagnosis, as the histological gain from this procedure is important in guiding surgical treatment. Most of the PT is benign with 15% to 30% being classified as malignant [1-8]. PT is generally divided into benign, borderline and malignant histotype based on the macroscopic appearance of the stromal component [3-5]. A benign tumour is characterized by 0 - 4 mitosis/10 high power field (HPF), predominately pushing margin, and usually 1+ but occasionally 2+ stromal atypia. Borderline tumour are determined by 5 - 9 mitosis/10 HPF, pushing or infiltrating margin, and 2+ stromal atypia and malignant PT is characterized by 10 or more mitosis/10 HPF, predominately infiltrating margin usually 3+ but occasionally 2+ stromal atypia [3-5]. Histological appearance may not however correlate with clinical behavior as both malignant and borderline tumour has been shown to be capable of metastasizing. Histotype however is reported to be an independent prognostic factor with 5 year survival of 95.7% for benign tumours, 73.7% for borderline and 66% for malignant tumours [1-4,7,8]. The 10-year survival drops to 79% for benign and 42% for malignant tumours [1-4,7,8,14-16]. Metastasis has been noted in 25% to 31% of malignant PT but in only 4% of all PT [1-4]. The most common sites of metastasis include lungs; bone liver and distant lymph nodes [1-5,14-16]. Skin involvement with tumour does not appear to be a predictor of metastasis. About 20% of patients have palpable axillary lymphnodes on presentation but only 5% of these show histological evidence of metastasis upon pathological examination [1-5,14-18]. Among the malignant PT only 15% metastasize to axilla [1-4]. The metastatic lesion contains only stromal elements with no malignant epithelial elements observed. In view of the rarity of lymph nodal involvement most of the authors are of the view that routine removal of lymph nodes is not necessary unless they are palpable [1-4]. About 20% of PT is considered giant when the size exceeds 10 cm in diameter [5,14-18]. However the importance of this cut off value has been disputed as there is a continuing debate over the prognostic significance of the tumour size [1,2]. Even though malignant tumours tend to be larger than benign, the malignant histotype correlating with size has not been well established [1,2]. Various factors have been found to be related to clinical behavior and outcome. 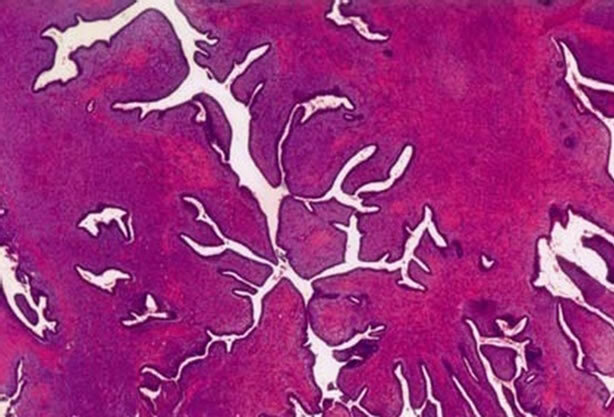 Of these stromal overgrowth, tumour necrosis and mitotic activity have been found to be the most consistently associated with recurrence, metastasis and poor survival [2,14,15]. Other factors that may correlate with outcome are tumour size [2,3,15,16], stromal atypia  and stromal cellularity , lymph node metastasis , age [2,16], nulliparity and absence of cysts. Local recurrence usually occurs within few years after the surgery and histologically resembles the original tumor [1-6] [Table 1]. Occasionally recurrent tumour shows increased cellularity and more aggressive histological features than the original lesion [2-6]. This was evident in our case where an initially benign tumour recurred as borderline malignant tumour. In most patients local recurrence is isolated and is not associated with development of distant metastasis [1-4,14-17]. Among these various pathological factors, mitotic activity and inadequate margin clearance following resection was strongly associated with recurrence while stromal cellularity, stromal overgrowth, stromal atypia, along with mitotic activity, tumour margin positivity and heterologous stromal elements significantly correlated with metastasis . All PT can recur regardless of their histotype although the risk of recurrence is low in benign form, ranging from 4.7% to 30%, and notably higher in borderline and malignant form (30% to 65%) [1-5,14-16]. 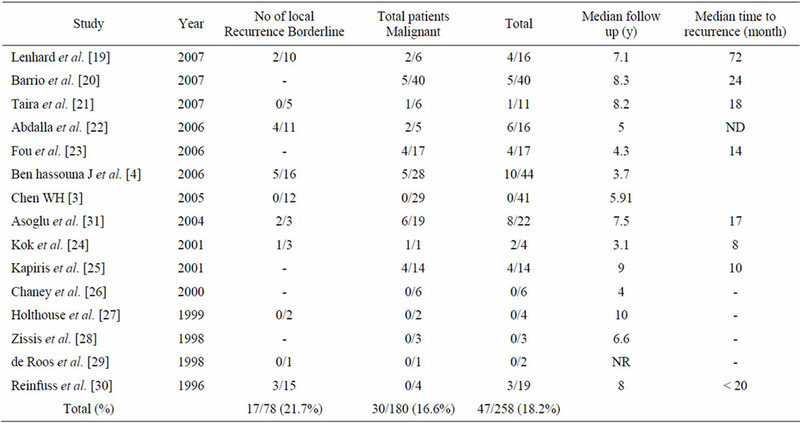 However review of literature of recent publications revealed that local recurrence after margin negative breast conserving resection of borderline malignant and malignant PT was found to be 21.7% and 16% respectively [3,4,19-31] (Table 1) Local recurrence can usually be controlled by further wide excision and mastectomy is invariably not required. Mastectomy is however considered for local recurrence after local surgery has been performed for borderline or malignant tumour [1,2]. Occasionally aggressive local recurrence can result in widespread chest wall invasion with direct invasion of the underlying lung parenchyma. Isolated reports of good palliation in this situation with radiotherapy have been reported . Table 1. Review of literature—local recurrence after margin negative breast conserving resection of borderline malignant and malignant phyllodes tumours. therapy or chemotherapy remains uncertain . Some investigators report that radiotherapy improves disease free survival [32,33]. A significant reduction in local recurrence has been reported when margin negative resection has been combined with adjuvant radiotherapy; Adjuvant radiotherapy following margin negative resection of borderline and malignant PT, lead to reduction of recurrence from 86% without adjuvant radiotherapy to 59% when radiotherapy was used (p = 0.02) . There are others who recommend adjuvant radiotherapy only in cases of incomplete resection [8,32]. Chemotherapy may be considered in patients with stromal overgrowth . However to date neither adjuvant radiotherapy or chemotherapy are routinely recommended [1-4]. PT represents a heterogeneous group of tumours sharing the same macroscopic features with an unpredictable outcome. The prognosis depends on the histological and biological characteristics of the tumour rather than their clinical behavior. 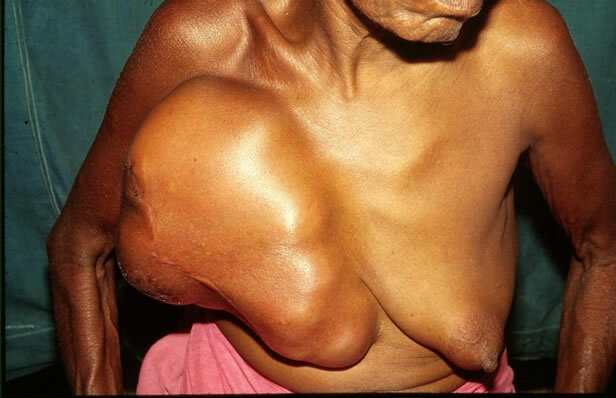 Giant PT constitutes 20% of these tumours and would invariably need mastectomy. The data concerning the prognostic factors of PT are conflicting and both benign and malignant PT could recur or metastasize. While ultrasound, CT and MRI of the breast could be suggestive of PT, establishing a definite preoperative diagnosis may be difficult and would invariably need core biopsy. Surgery remains the cornerstone of treatment consisting of resection with healthy surrounding breast tissue at initial surgery. Local recurrence can be controlled with further surgery and may not be associated with distant metastasis. Routine axillary lymph node dissection is not recommended. High risk of local recurrence and or metastasis is usually associated in patients with large tumours, infiltrating tumour margin, severe stromal overgrowth, atypia and cellularity. W. H. Chen, S. P. Cheng, C. Y. Tzen, T. L. Yang, K. S. Jeng, C. L. Liu and T. P. Liu, “Surgical Treatment of Phyllodes Tumours of the Breast. Retrospective Review of 172 Cases,” Journal of Surgical Oncology, Vol. 91, No. 3, 2005, pp. 185-194. N. Matar, A. Soumani, M. Noun, T. Chraibi, A. Himmi, A. El Mansouri, et al., “Phyllodes Tumour of the Breast. Forty One Cases,” Journal de Gynécologie, Obstétrique et Biologie de la Reproduction, Vol. 26, No. 1, 1997, pp. 32-36. J. F. Stebbing and A. G. Nash, “Diagnosis and Management of Phyllodes Tumour of the Breast: Experience of 33 Cases at a Specialist Center,” Annals of the Royal College of Surgeons of England, Vol. 77, No. 3, 1995, pp. 181-184. P. De Albertis, M. Oliveri, P. Quadri, G. Serafini, A. Cavallo, O. Orlando, et al., “Retrospective Analysis of Color Doppler Ultrasonography and Flowmetry Findings in Solid Nodular Pathology of the Breast,” Radiology Medicine, Vol. 89, No. 1-2, 1995, pp. 28-35. M. Takahashi, K. Murata, M. Mori, N. Kawaguchi, A. Furukawa, R. Kushima and R. Morita, “Giant Metastatic Cystosarcoma Phyllodes to the Lung: CT and MR Findings,” Radiation Medicine, Vol. 10, No. 5, 1992, pp. 210-213. R. W. McDivitt, J. A. Urban and J. H. Farrow, “Cystosarcoma Phyllodes,” Johns Hopkins Medical Journal, Vol. 120, No. 1, 1967, pp. 33-45. H. Abdalla and M. Sakr, “Predictive Factors of Local Recurrence and Survival Following Primary Surgical Treatment of Phyllodes Tumour of the Breast,” Journal of the Egyptian National Cancer Institute, Vol. 18, No. 2, 2006, pp. 125-133. K. Kok, P. Telesinghe and S. Yapp, “Treatment and Outcome of Cystosarcoma Phyllodes in Brunei: A 13 Year Experience,” Journal of the Royal College of Surgeons of Edinburgh, Vol. 46, No. 4, 2001, pp. 198-201. M. Reinfuss, J. Mitus, K. Duda, et al., “The Treatment and Prognosis of Patients with Phyllodes Tumour of the Breast,” Cancer, Vol. 77, 1996, pp. 910-916. *Disclosure: There is no conflict of interest and there is no financial assistance from any source.